** Data for 8 / 12-wheel tender locos. QJ 6751 was one of around 100 of the class employed by the JiTong Railway on it's 943 km line across Inner Mongolia. It was typical of later members of the class with full size smoke deflectors and a 12-wheel tender. Unfortunately, the gleaming paintwork was untypical in the last years of steam operation. 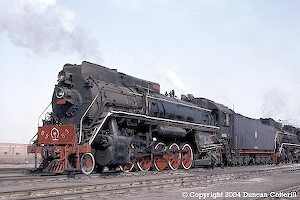 The QJ was the last steam design to go into production, the first the Chinese claimed as their own and the most numerous steam class to run in China. Almost half the steam locos built in China after Liberation were QJs with over 4700 being produced in total. The origins of the QJ design go back to the Soviet Union around the end of the Second World War. The Russians captured large numbers of German kriegslok 2-10-0s as they advanced across eastern Europe. Over 150 of the heavier class 42 version were taken back to the USSR, regauged and reclassified TL. The TLs were robust, powerful and less damaging to poorly maintained track than the lumbering FD, SO and E classes then in use. They clearly impressed their new owners and it wasn't long before a Russian locomotive with similar characteristics appeared. The L class 2-10-0 was based on the latest Russian (i.e. mainly 1930s American) practice and was a great success with 4200 being built between 1945 and 1955. The next development was the LV, closely related to the L but with a larger firebox, 2-10-2 wheel arrangement and various other improvements. The LV went into production in 1954 but only 522 had been built by the time all steam construction was abruptly terminated in 1956. Both the L and the LV had an 18 ton axleload but a larger locomotive, with a 21 ton axleload, was also under development. Little is known of the OR-21 design, except that two prototypes were produced at Voroshilovgrad in 1954, two years after the same works had produced the OR-18, the prototype for the LV. In 1955 the USSR took the decision to modernise its railways with diesel and electric traction and the OR-21 didn’t go into production. Shortly afterwards, on 18 September 1956, a loco bearing an uncanny resemblance to an enlarged LV with a 21 ton axleload emerged from Dalian works. This was HP 0001, the first prototype for what was to become the QJ class. China was receiving technical assistance from the USSR at the time and it is quite possible that this included drawings, tools and jigs developed for the OR-21 but no longer required. Series production in China didn't commence for another eight years, by which time relations between China and Russia had cooled and several changes had been made to the design, principally to the boiler and firebox. Altogether 42 prototype QJs were built by Dalian, Tangshan, Mudanjiang, Shenyang, Changchun and Datong between 1956 and 1960. The first production locomotive, QJ 101, didn't appear until 1964 and construction then continued until the end of 1988. In total, 4714 QJs were built, all but 24 of them at Datong. 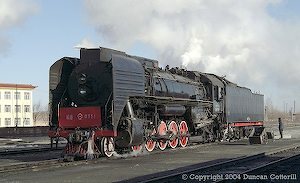 QJ 3450 of Bei'an depot was photographed in 1999, the last year of steam working in Harbin Bureau. It was one of around 3600 QJs built with an 8-wheel tender and retained this to the end. Many earlier locos were retrofitted with 12-wheel tenders during their careers. The high smoke deflectors were a locally applied modification favoured by a minority of depots and radically changed the appearance of the engines. Revisions were made to the production design at various times. The most noticeable change being the use of an oblong ejector (similar to a Giesl but unlicenced) instead of the conventional round chimney. Even this was only apparent when looking down on the engine or standing broadside to a hard working locomotive. Adoption of the oblong ejector varied from depot to depot. Some places, e.g. Changchun, were keen and retrofitted many of their older engines, while others stuck with conventional chimneys, even on new construction. The prototypes were numbered in widely spaced blocks depending on where they were built. The Dalian engines were QJ 0001-0005, Tangshan's QJ 1001-1008, Shenyang's QJ 1501-1506, Mudanjiang's QJ 2001-2003, Changchun's 3001-3002 and Datong's QJ 3501-3518. QJ 0004/5, 1001/2/3, 1501, 2001/2/3 were built with 12-wheel tenders, the remainder had 8-wheel tenders. Production locomotives were numbered from QJ 101 to QJ 3602 (missing out the numbers taken by prototypes) and from QJ 6001 to QJ 7207. The former were built with 8 wheel tenders although many acquired 12-wheelers in later years. Locos numbered from QJ 6001 upwards had 12-wheel tenders from new. A batch of 80 locos with 12-wheel tenders was built in 1968/9 but otherwise, early production concentrated on the 8-wheel version. From 1981, construction of locos fitted with the 12-wheel design recommenced and virtually no 8-wheelers were produced after 1982. The exception was a batch of four broad gauge locos built in 1985 for shunting at Erlian and working across the Mongolian border. An earlier batch of five Russian gauge locos had been built in 1976. A number of experiments were carried out in the 1980s. QJ 6191 carried the experimental oblong ejector, a modified blastpipe and increased superheater area resulting in a modest improvement in thermal efficiency. QJ2 0001 was a very unconventional locomotive designed in conjunction with the China Academy of Railway Science. The tender carried a coal gasification plant which fed gas to a burner in the firebox of an almost normal QJ. As far as is known, it only made three unsatisfactory test runs and was eventually converted to a conventional loco and sold to industry as QJ 7291 in 1992. David Wardale, of "Red Devil" fame, was also engaged in the mid 1980s to help develop an improved QJ. Tests were carried out with two modified locos fitted with Gas Producer Combustion Systems (GPCS). The first loco, QJ 7036, was a conventional loco rebuilt with a Cyclonic GPCS. It was later returned to original condition and sold in 1988. The second machine, QJ 8001, was built new with a conventional GPCS. QJ 8001 was tested for several months between Hohhot and Baotou but by 1988 the official policy had shifted in favour of diesels and electrics and there was little interest in further development of steam traction. QJ 8001 was retired to Datong Museum. David Wardale's book "The Red Devil and Other Tales from the Age of Steam" contains an interesting technical assessment of the QJ and gives a real insight into the difficulties encountered during the tests. Over the years, the class name was changed twice. The original designation was HePing, HP or Peace but during the turmoil of the Cultural Revolution it was changed to FanDi or Anti Imperialism. This was abbreviated to FD, leading to confusion with the Soviet FD (Feliks Dzerzhinskii) class which were also running in China in the 1960s. The Russian engines were classed FX by the Chinese at the time and only regained their FD classification after the former HP class became Qian Jin, QJ or Advance class in 1971. Baotou depot retained a few QJs for working heavy trip freights around the city long after the main lines went diesel. Some, like QJ 6563 seen here at Baotou Dong in 1999, lost their smoke deflectors altogether to improve visibility during shunting operations. The rapid expansion of China's rail network between the mid 1960s and the mid 1980s was QJ powered. The class reached its zenith in the late 1980s. At that time, QJs dominated China's main lines. They hauled the vast majority of the country's freight traffic on both main and secondary lines, as well as a significant proportion of passenger trains, including many expresses. The glory days didn't last long though. Between 1987 and 1997, the class lost virtually all its main line work to new diesels and electrics. 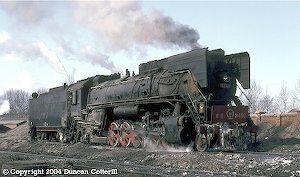 Many of the older engines went for scrap early and reports of locos numbered under 1000 in service are rare after 1991. Newer machines ousted the last pacifics from secondary passenger duties or replaced JSs on those branches which could take their weight but even they didn't last long. The official end of steam on the national railway system was in March 2002 but a handful of QJ remained in use on the remote Wuhai - Jilantai line until the summer of 2003. In the 1990s, large numbers of QJs became redundant, many of them less than 10 years old. Larger industrial concerns and local railways found they could buy several freshly overhauled QJs for the price of a single diesel and a significant number gained a second lease of life away from the national system. Most significant of these operations was the Ji - Tong Railway, a joint-venture between the government of Inner Mongolia and CNR which used around 100 QJs to operate its 943 km line linking Tongliao with Jining. Diesels displaced the last QJs from this last stronghold of steam power in late 2005. For information on how the line was operated and what it was like to work on the footplate of a QJ, see Hans Schaefer's excellent website. Elsewhere in China, QJs are still employed by some of the larger coal mining operations but most have given way to diesels over the last couple of years. Many QJs had disappointingly short lives. Most of the early locos managed a respectable 20 - 25 years but a significant number of 1970s and 1980s built locos went for scrap after 10 - 15 years. Out of a total of 4714 locos built, the vast majority have already been scrapped or dumped and the rest are rapidly being displaced by diesels. Finding a working QJ in China in 2010 is still possible but it’s not easy. A handful of locos remain in use in central China, particularly around Yanzhou in Shandong. Several locos have been preserved including prototypes QJ 0001 and 0004 in the Beijing Railway Museum along with the first production machine, QJ 101. QJ 1337 is preserved in the Shenyang museum but most of the others are inside CNR loco depots and visits are actively discouraged.